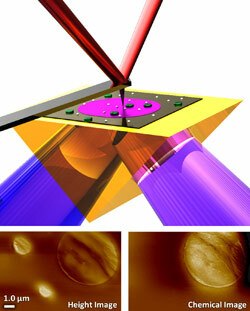 (February 27 2013, Santa Barbara CA) – Anasys Instruments reports on the NIST announcement in their Tech Beat publication which describes the work of Andrea Centrone and his colleagues demonstrating the use of AFM-IR for chemical composition studies at nanoscale resolution. The sample (green/white) absorbs infrared laser light (purple) at wavelengths determined by its chemical composition, causing it to expand, which deflects the AFM cantilever. Bottom left: The AFM detects the height of two small polystyrene particles and a large polymethylmethacrylate (PMMA) particle. Bottom right: The light is tuned to be absorbed only by PMMA but not by polystyrene. Combining the data and recording chemical images at different wavelengths produces a map of the surface’s topography and chemistry. The latest work from NIST researchers applying photothermal induced resonance (PTIR), a technique also referred to as AFM-IR, has just been reported in NIST’s newsletter, Tech Beat. Photothermal induced resonance (PTIR) has recently attracted great interest for enabling chemical identification and imaging with nanoscale resolution. In this paper, electron beam nanopatterned polymer samples are fabricated directly on 3D zinc selenide prisms and used to experimentally evaluate the PTIR lateral resolution, sensitivity and linearity. The authors have shown that PTIR lateral resolution for chemical imaging is comparable to the lateral resolution obtained in the atomic force microscopy height images, up to the smallest feature measured (100 nm). Spectra and chemical maps are produced from the thinnest sample analyzed (40 nm). More importantly, experiments show for the first time that the PTIR signal increases linearly with thickness for samples up to ≈ 1 μm (linearity limit). This is necessary if the PTIR technique is to be used for quantitative chemical analysis at the nanoscale.